Implementation of ESI Scheme u/s 1(3) of ESI Act, 1948 in Patadi (Urga) area of Chhattiasgarh. Enclosed is the Implementation of ESI Scheme u/s 1(3) of ESI Act, 1948 in Patadi (Urga) area of Chhattiasgarh. Pls click below for the said notification. 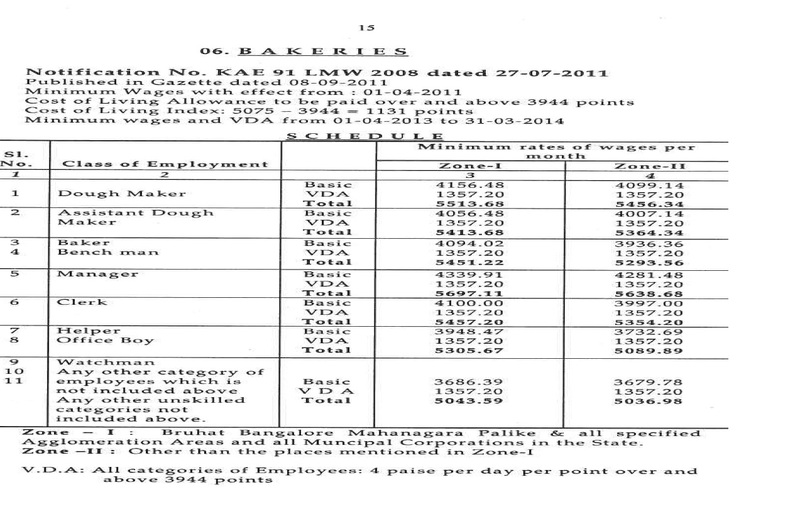 This is for your kind notice that the Punjab Government has further enhanced the minimum rates of wages w.e.f. 01.09.2013 in respect of 71 Scheduled Employments. The increase in wages for monthly rated employee is Rs. 552.75 and for daily rated is Rs. 21.44 & for hourly worker is Rs. 2.68. The above increase is to neutralize the cost of living. The minimum rates of wages are linked with Consumer price index Numbers (State Series 1987 -100). The adjustment of wages are made after an interval of six months taking the average of CPI numbers compiled by the Punjab Government. The detail of ENHANCED/Adjusted minimum rates of wages for monthly rated and daily rated and hourly rated employees under different categories are given in the attachment. Delhi High Court in its order dated 22.7.2013 (copy attached) in the case of Whirlpool of India Ltd vs RPFC has held that Canteen Allowance is part of basic wages and PF is to be deducted therefrom. Employers from across the nation have begun sending their digital signatures to the Employees Provident Fund, with Kochi firms leading others in sending the largest number of such signatures. The signatures are needed to begin online transfer of provident fund and the signatures would be used for verification in the future. EPFO has set a seven day deadline for all employers with more than 1,000 workers for sending digital signatures. This is part of an effort to put in place a system of online transfer of provident fund claim settlements. The Chief Provident Fund Commissioner KK Jalan has written to all the 122 Provident fund offices in the country indicating timelines for implementing the online transfer scheme. In a letter dated July 31, he said, "I would emphasise that all employers who have employees strength more than 1,000 should be asked to give their digital signatures within next seven days. It s not difficult to do so as all these employers in any case will have their digital signatures for some other purposes." Employers with an employee strength between 100 and 1,000 have been given more time. The EPFO has set a target of covering 50% of thee employers by August 20. PF offices also have been asked to introduce amended transfer claim forms in every region from August 20. A campaign has already been launched to motivate employers to give their digital signatures. Once the transfers begin online, the time taken for the procedure of settlement of claims is expected to come down from the current 30 days to just three days. The EPFO has so far received 675 digital signatures from various employers. The largest number of such signatures were received from employers in Kochi in kerala, officials said. Taking the first step towards launching online PF transfer claims, EPFO had earlier this month unveiled a revised claim form for the purpose. EPFO is likely to start the online PF transfer claim facility by the end of August. This would enable EPF subscribers to apply online to transfer their accounts through their new employers. The revised transfer claim form can be presented after verification by the present employer or the previous employer. Previously, the form could be submitted only after verification by the present employer. EPFO has started Employer Online Transfer Claim Portal. EPFO introduces a new system to facilitate online submission of transfer claims by Members with an objective to make the transfer process transparent, efficient and comfortable for your employees. You are urged to bring this facility to the notice of all your employees which is available on EPFO's Member portal. A member has an option to submit his claim either through his present employer or the previous one. ESIC Coverage area extended in state of Tamilnadu for those who have their manufacturing units in Oragadam and surrounding Areas, please note the ESI Applicability comes in to effect vide Notification dated 22nd April 2013. Copy of Notification is attached for your ready reference. The Delhi Government has decided to implement the revised rates of minimum wages for unskilled, semi-skilled and skilled categories in all scheduled employments, Labour Minister A.K. Walia said on Monday. The new rates, which have been worked out after adjustment of dearness allowances, have come into effect from April 1, 2013 and will extend to clerical and non-technical supervisory staff as well. Now the monthly minimum wages of unskilled workers has been fixed at Rs.7,722 (previously Rs.7,254) and per day wage has gone up from Rs.279 to Rs.297. The monthly wages for semi-skilled workers has gone up from Rs.8,528 to Rs.8,008 (per day wage from Rs.308 to Rs.328) and for skilled workers the new wages have been fixed at Rs.9,386 (previously Rs.8,814) increasing the per day wage to Rs.361 from Rs.339. For clerical and non-technical supervisory staff, the new monthly wages for non-matriculates has been fixed at Rs.8,528 from Rs.8,008 (per day wage has gone up to Rs.328 from Rs.308). For matriculates but non-graduates, the wages have increased to Rs.9,386 from Rs.8,814 and for graduates and above it has been fixed at Rs.1,0218 instead of Rs.9,594. A Mediclaim policy is one that refers to the medical insurance of individual, HUF, spouse, parents or dependent children, also known as health insurance .The section 80D of Income Tax Act provides for deduction of the payment made subject to the premiums of such medical policies. This exemption is over and above the deductions of Rs.1,00,000 under the section 80C. Medical insurance is vital in order to insure the health and safety of the family members, and it comes to aid in times of illness and makes up for your medical expenditure. Parents: Parents of the individual and of the spouse may be covered under this irrespective of their dependence on the assessee. Dependent children: legitimate children or legally adopted children fall under this category and may be insured by the taxpayer. This includes male child who is unemployed, under the age of 25 yrs and he is a bonafide student fully dependent on the assessee . In case of a girl child, she is considered d as dependent until she is unmarried. And in case of an HUF, any family member can be insured. Basic deduction: The insurance premium of self, spouse and children is covered under this amount. Maximum deduction upto Rs.15000 is allowed .however, a deduction upto Rs.20000 is allowed in case the insured person is a senior citizen. Additional deduction: Includes the medical premium paid for parents and a maximum deduction upto Rs.15000 is allowed. If the parent in this regard is a senior citizen then the amount is increased upto Rs.20000. The premium can be paid for any member of HUF and the maximum deduction of Rs.15000 is permissible. Only when the person is a senior citizen the amount available for deduction is Rs.20000. The section 80c provides deduction from the taxable income for the tuition fees paid for his/her children .The upper limit for the deduction under this section is Rs 1 lakh. Parents are allowed to claim the deduction for their children’s tuition fees. This deduction is strictly available only on the tuition fees paid and not the exam fee, sports fee, lab fee, admission fee or the hostel fee. A parent is individually allowed to claim deduction for two children , thus both the parents can together claim deduction for four children. The deduction claim is permissible for only full time courses and not part time, coaching classes, distance learning or private tuitions. This however includes tuition fees for playschools and pre-nursery. The deduction is available on the amount paid by the individual and the period for which the payment is made is not to be considered. 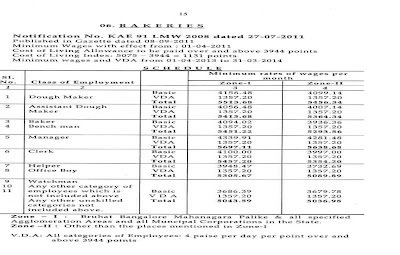 The revised minimum Wages rates in the schedule employment in Haryana State effective from 01/01/2013 are as under. Hence you are requested to kindly look forward and take appropriate action to kindly implement the revised minimum wages rates w.e.f. 01/01/2013 in the Factories and Establishment working in Haryana State. Kindly ignore if your establishment is not falling in the territorial jurisdiction of Haryana State.